A lady who knows her own mind! I like that. Fabulous sketch - you can absolutely see what a character she is. came by from owen's place. great stuff! i will have to visit often. I simply love it! Great job. As always. take it easy on her Stephen! That is so funny! 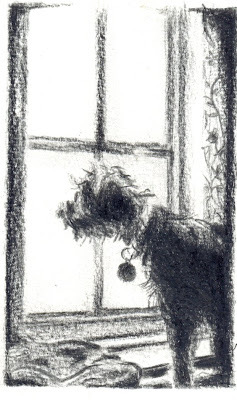 Wonderful sketch...you catched her nicely contemplating the rain. Gorgeous drawing! Throw back to early 20th century book illustration.